Quiet forests with only the sounds of chirping bids and the rustle of leaves in the breeze. Natural beauty isn't always something that you can simply just drive-up upon. However, The Foothills Parkway allows you to do just that. Wind through miles of peaceful woodlands, where several pull-offs afford drivers a chance to take time to enjoy the magnificent vistas that dot this Great Smoky Mountain Parkway. 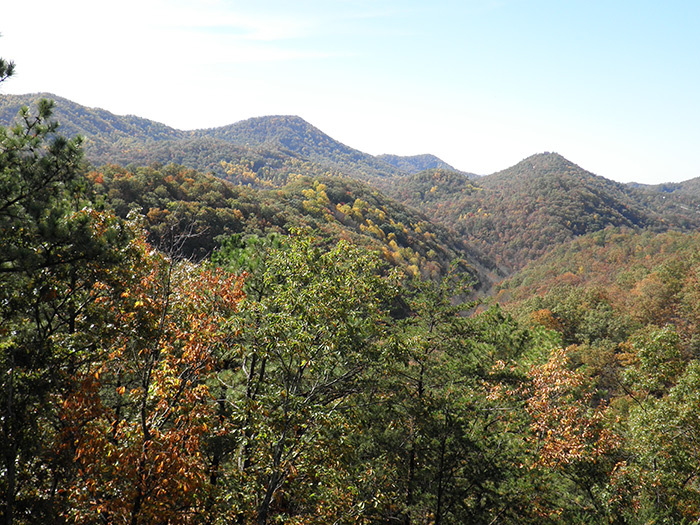 Here you'll find Look Rock of the Smoky Mountains, which offers panoramic views of the surrounding landscape. Guests staying in Wears Valley Cabins will want to head to Townsend to enjoy a leisurely day-trip down this Great Smoky Mountain Parkway. So, make a playlist to enjoy the scenery with and make the journey through the breath-taking high-elevation Smoky Mountain Foothills Parkway. The Foothills Parkway was authorized for construction in 1944, but remains unfinished. As of 2010, only a third of the Great Smoky Mountain Parkway has been completed, and legislative and funding setbacks have stunted the original intents of the Foothills Parkway construction project stretch from I-40 to Chilhowee. Currently, Foothills Parkway is divided into two sections, Foothill Parkway West, which runs from Walland to Chilhowee, and Foothills Parkway East, which travels from Cosby to I-40. Ongoing, Foothills Parkway construction continues despite setbacks, with most of the focus on the Wears Valley section of this Great Smoky Mountain Parkway. Open sections of the Foothills Parkway are opened year-round, weather permitting, and intermittent work continues on unfinished sections of the Parkway. Foothills Parkway Photography- The various pull-offs along the this Smoky Mountain parkway invites drivers to snap shots of scenic sunrise or sunsets. Capture candid moments of Smoky Mountain wildlife, wildflowers, trees, and landscapes. Foothills Parkway "Tail of the Dragon" Access- A favorite among motorcycle-enthusiasts in the Smokies, The "Tail of the Dragon" rests just of the Foothills Parkway and boasts a total of 318 curves in 11-miles, making for a thrilling ride for careful motorcycle riders. It is not advised to travel the "Tail of the Dragon" under inclement weather conditions as the numerous curves make it a particularly dangerous ride. Peace and Quiet at Foothills Parkway - Because this Great Smoky Mountain Parkway doesn't boast as many travelers, vacationers can enjoy true peace and quiet at the pull-out along the Foothills Parkway, where you can snap photos or enjoy a quiet picnic under the shade of the mountains trees. One of the highlights of Foothills Parkway, Look Rock offers panoramic views of the surrounding landscape from a natural observation ledge and its observation tower. Only a 1/2 mile hike from the Look Rock parking lot, brings you to the Look Rock observation tower which offers 360-degree views of the mountains. Since the Foothills Parkway is less crowded, Look Rock offers a perfect place to observe fall foliage during peak times in October. The natural Look Rock observation ledge rests on the west side of the Look Rock parking lot, but does not offer the same 360-degree views as the Look Rock observation tower. The Foothills Parkway offers a quiet, less-crowded Smoky Mountain Parkway to enjoy the beauty and tranquility of the Smoky Mountains. Come enjoy a leisurely drive down the curves of the Foothills Parkway today!